There are loads of highly secretive Star Wars projects being worked on at Lucasfilm these days that fans would love to know more about. One such project is the video game that the Electronic Arts studio Visceral is working on. The game was part of the original announcement that EA would be making Star Wars games, but since then, with the exception of learning some members of the creative team and a quick video preview at E3 2016, very little has been said about the game. 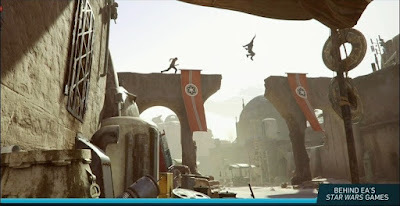 Over the past week, our friends over at MakingStarWars.net have been releasing some insider information about what game will be about. This week, they have even more information about a new character in the game. As always, there is a chance this may not be true, but if you are trying to avoid all Star Wars spoilers stop reading now. This is your SPOILER ALERT! In case you missed it, previous reports revealed that the game will focus on "Dodger" (that's his codename), an Alderaanian survivor and Imperial draft dodger who takes a job from Jabba the Hutt so he can pay off corrupt Imperial officials to take his name off the list of Alderaan survivors. Meanwhile the Rang Clan are mining the remains of Alderaan to create a new chemical weapon that they will attempt to sell to the Empire. Dodger will witness the weapon being used on a close friend, and he will be forced to confront his past and decide what he truly believes. "Robie Mattox is a woman in her early thirties that is Dodger’s partner in crime. She’s a gunslinger with an attitude and is one of the only people Dodger can trust both personally and in a fight. We cannot understate her importance to the series being laid out right now as she’s our other main hero. Supposedly the plan is to have her take center stage in a sequel down the road." Her parents were killed when she was young and she grew as an orphan on level 1313 on Coruscant after being taken in by the Wandering Star crime family. She is depicted as looking like actress Natalie Morales in concept art, though no word on whether Morales is actually involved in the project. She doesn't like droids (and Dodger's other companion in the game is a droid name Dok, so that should be an interesting relationship). Robie will meet Dodger when Dodger is hired by Jabba the Hutt to kidnap Oona Sable, the daughter of a key Rang Clan underboss. It will be cool to learn more about Robie as we get closer to the release of the game. Apparently her banter with Dodger is suppose to be very well done, which should add another fun dimension to the game. The fact that she comes from level 1313 is intriguing. This raises the question of how much this game borrows from the cancelled Star Wars 1313 game. It's also interesting that the game is already being looked at as the launching point for a series, with a sequel focused on Robie.